Bringing a space to life is no easy feat and with a 20-foot by 10-foot booth, making it cohesive also lends itself more brain power. So when Bob Cut and Room & Board came together on Bob Cut's American Craft Fair booth, sparks flew. With only a list of color and moods to go on, the Room & Board design associates hit the design floor running. 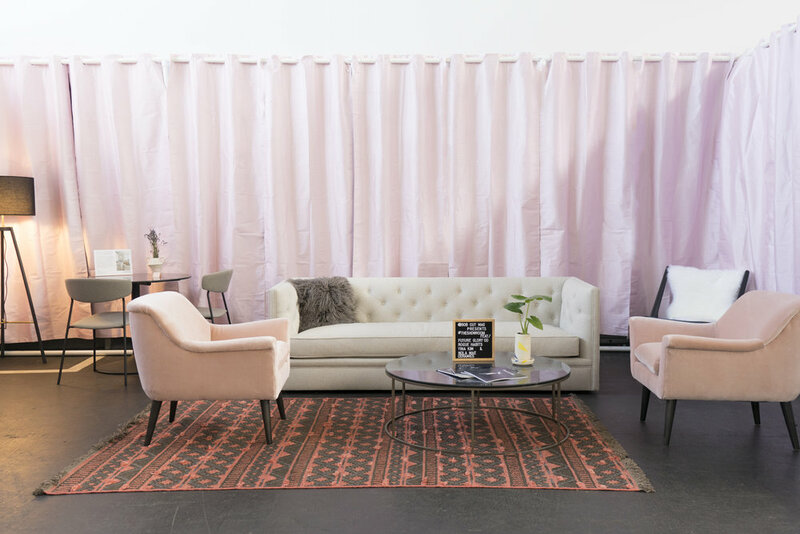 Scouring beautiful pieces such as the Murphy Chair & Ottoman (personal fave) and the Ember Rugs, the Bob Cut aesthetic came together in less than 24 hours. 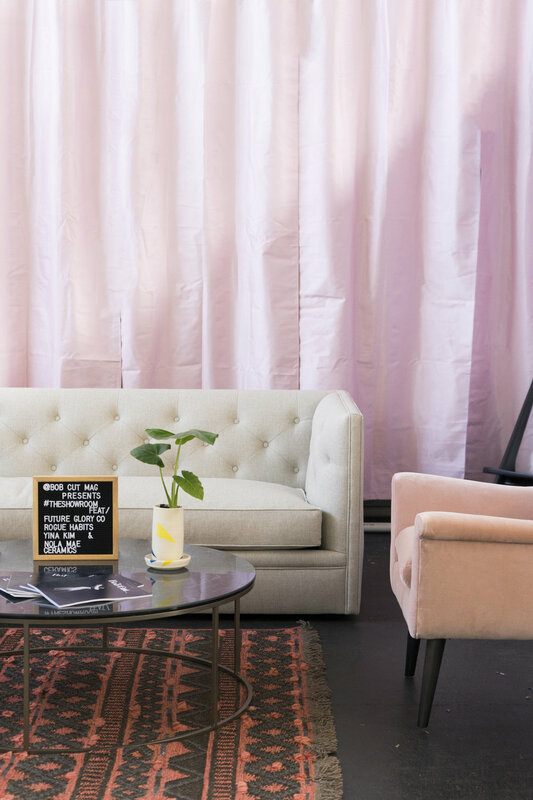 // Check out the final collaboration down below and shop the pieces from our Showroom; 685 7th St, SoMa, roomandboard.com. Room & Board also offers free design services to those wanting to redesign their own spaces. Enjoy complimentary design services including furniture recommendations, color, material and paint suggestions and digital floor planning. They're here to help with projects of any size, from finishing touches to furnishing an entire home. Featuring the Embers Rugs, Tyne Round Coffee Table, Nola Mae Ceramics, Murphy Chair & Ottoman, and the Macalester Sofa. Featuring Nola Mae Ceramics and the Brixton Console Bookcase. Featuring Yina Kim, Nola Mae Ceramics, the Brixton Console Bookcase, and the Crocus Floor Lamp. Featuring the Tyne Round Coffee Table, Nola Mae Ceramics, the Pepper Pillow Ensemble, Murphy Chair & Ottoman, and the Macalester Sofa. Featuring Yina Kim, Nola Mae Ceramics, and Brixton Console Bookcase. Featuring the Embers Rugs, Murphy Chair & Ottoman, and the Crocus Floor Lamp. Featuring the Embers Rugs, Tyne Round Coffee Table, Nola Mae Ceramics, Yina Kim, the Pepper Pillow Ensemble, Murphy Chair & Ottoman, Oskar Lounge Chair, and the Macalester Sofa. Especially when we pop up!